Resistance in stocks can be divided into major resistance and minor resistance. Major resistance is more difficult to overcome compared to minor resistance. It takes much more buying power to overcome major resistance. Major resistance can easily be spotted by looking at longer time frames such as the weekly charts and the daily charts. You will be able to see that there has been a lot of trading activity in the area. When there is a lot of price action in that area, it means there is a lot of stock that has changed hands. 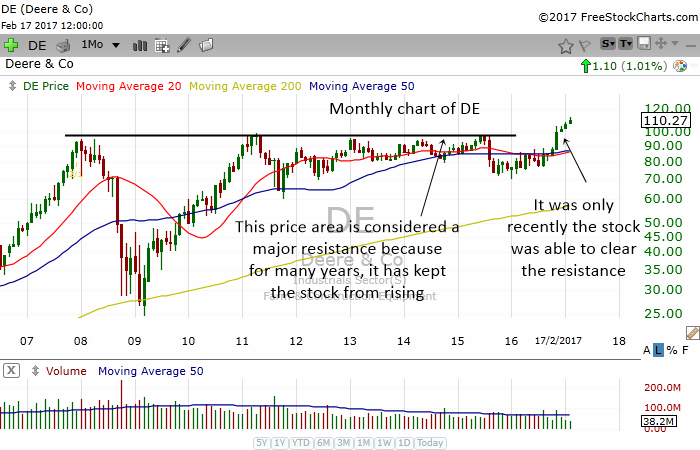 The chart above shows how DE encountered resistance around the $100 area for many many years. It tried many times to move above it but failed. The area is known as a major resistance because of its ability to keep the stock from rising for many many years. It was only recently that the stock was able to clear resistance. 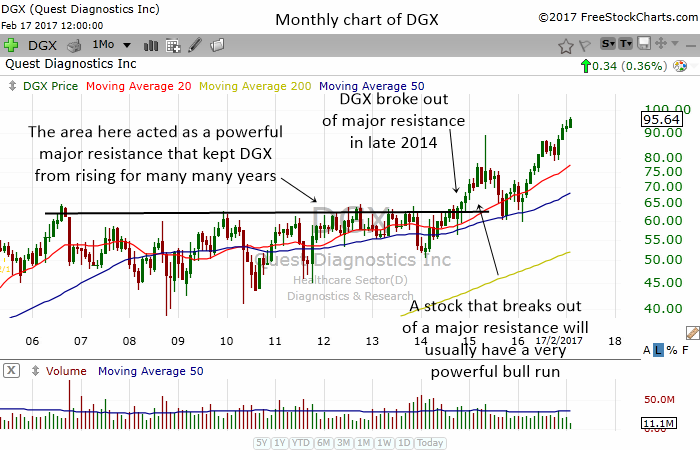 In the monthly chart of DGX above, you can see for many years DGX failed to rise above $65. The area acted as a major resistance for the stock. The stock broke out of the resistance area in late 2014. Tip: Once a stock breaks out of a major resistance area, they usually have very powerful bull runs. They usually come in a "V" shape. They are also much more shorter in time than major support which usually occurs in weekly and monthly charts. Although they are called minor resistance, they can act as a very powerful resistance when a stock is in an downtrend. When a stock is in a bearish mode, only a little resistance is needed to keep the stock from rising further. On the other hand, if a stock is in an uptrend, the minor resistance usually does not act as a big hindrance that keeps the stock from rising. That's because a stock that is an uptrend already has bullish momentum behind it to overcome the minor resistance. 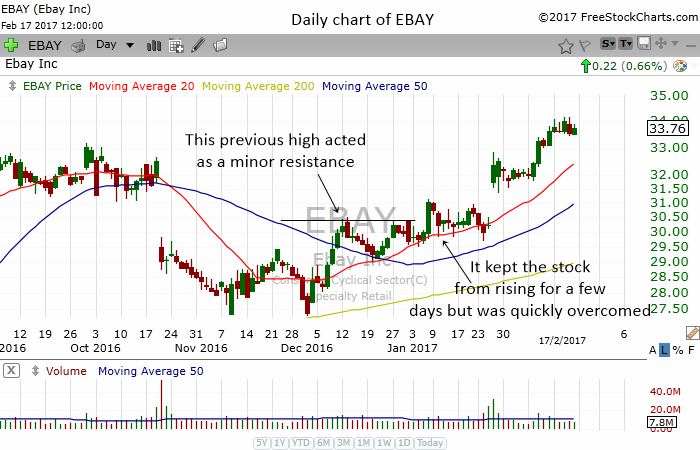 In the chart above, EBAY had a minor resistance in the middle of December 2016. The stock had a slight correction a few days later. The minor resistance kept the stock from rising for a few days but since the stock has already started a new uptrend, the minor resistance was easily overcomed. 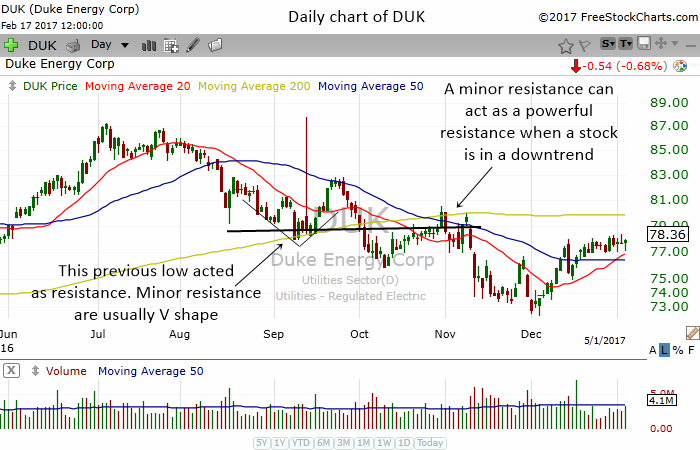 In the chart above, you can see DUK in a downtrend. The previous low in September acted as a minor resistance which prevented the stock from rising in November. When a stock is in a downtrend, the minor resistance can act as a very powerful resistance which keeps the stock from rising. 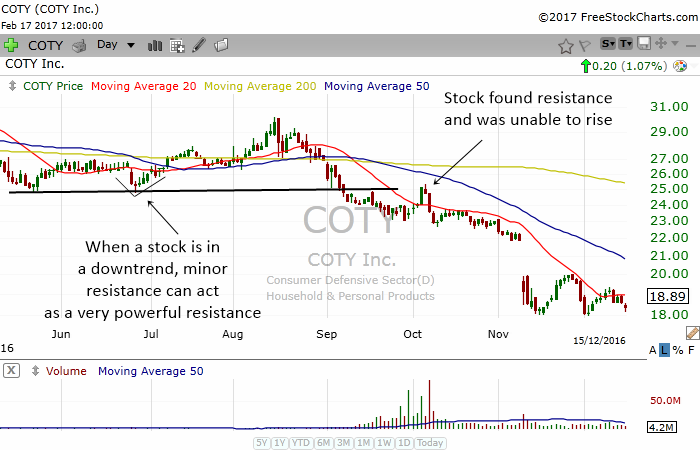 Notice in the chart above, how COTY tried to rally in early October. The stock was already starting a new downtrend and the minor resistance that formed in late June easily prevented the stock from rising.